This page recommends elements of UX design to incorporate into your app to maintain a consistent look-and-feel with the Amazon Appstore. To maintain a cohesive look with Amazon, the parts of your app's UI that deal with IAP should use the same color palette and styles as the Amazon Appstore. This section provides those values as a reference. Always provide an obvious visual indication that a purchased item is available and, if needed, how to access the item within the app. 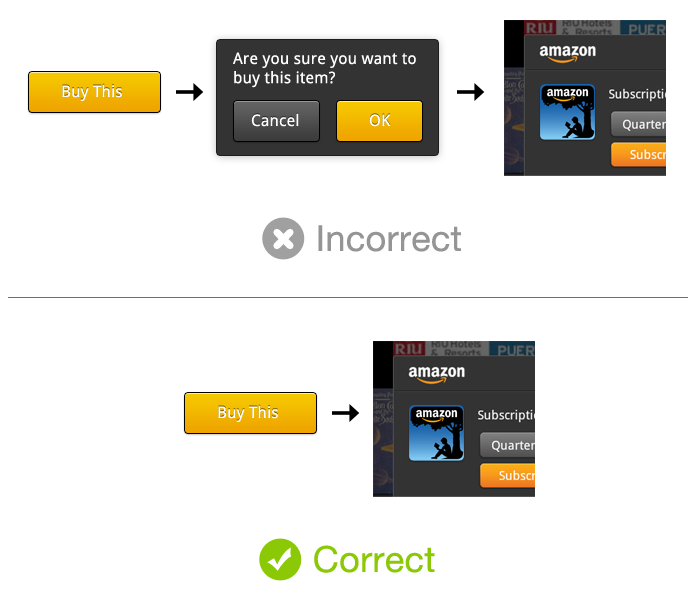 If your app requires that a user have an account to complete a purchase, have the user create the account before he or she can initiate a purchase. Use the IAP API to retrieve and display price and product information. Read the IAP documentation to determine how to handle all purchase responses. Note: An exception to this guideline is that you may display status messages when a user cancels out of an IAP transaction. These messages do not interrupt the flow and can be helpful to users. Prevent a customer from accessing content that they have previously purchased or have a current subscription for. Include extraneous steps or confirmations, such as extra dialog boxes, before the purchase experience.